just as suddenly, leaving a blazing hot sun in its place. our first beach trip of the season! hopefully make you a lovely little side dish this weekend. onions start to soften and then add the cumin seeds. Sauté further until you can smell the cumin. about a couple of tablespoons-full of water. or garam masala if desired. – Toss in the cilantro, stir, and take of the heat. bit of minced garlic, salt, pepper, olive oil and there you have it. Have a fantastic weekend wherever you are! I’ll see you when I get back! A scrumptious dish! That combo is awesome. Oh yeah, it's almost summer in the Philippines. Whenever the Holy Week rolls around, I know summer is just around the corner as well. Have fun in the sun, my friend! We are still knee-deep in winter here in Toronto! 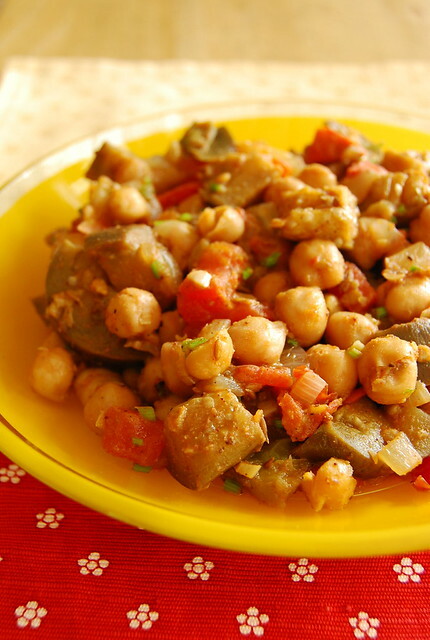 Looking forward to spring…On a different note, your eggplant chana masala looks delish! I am a big fan of Indian food – this is totally right up my alley! Hi Jen! Wow…amazing how we are at opposite ends of the weather spectrum but can trade recipes like we are doing it over the fence of our backyards (not that I have a backyard)! Hi Michelle! I is really awesome with garlic yogurt…I can eat tons!